KEEPER OF THE SNAILS: Castle by J Robert Lennon. 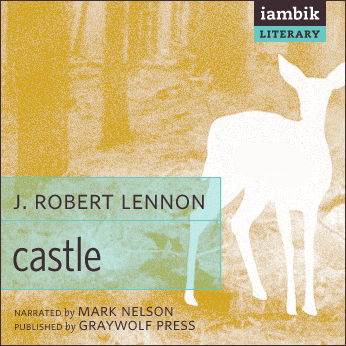 Castle by J Robert Lennon. Then, a little while later, and it is so seamless you hadn't noticed the change, you realize you are in another world. There is the man and his nemesis, the Professor. And this Professor, he's one of the most disturbing characters you've ever encountered. He's a psychologist interested in what makes people crack; what makes them survive; and what makes them stand and fight. And long ago, when the man was a child, he was the psychologist's main guinea pig. The Professor is intent on making the child strong and for this the child has not just to observe, but become used to performing barbaric acts of torture: a squirrel is systematically mutilated before being skinned, while the boy himself is anaesthetized before being left alone, naked and lost, in a forest for a day and most of a night. The child is also punished with the frequency, cruelty and apparent illogicality of a guard in a totalitarian regime. It is gripping, and last night, because I was unable to stand just listening to small snatches any more, listened to the end. The man meets his nemesis in a dramatic scene, but this isn't the end. The focus suddenly shifts to wartime Iraq, and the point of all that barbarity becomes obvious. The book is transformed into an important morality tale for our age. It is unexpected and stunning. The audiobook is aptly and very well read by Mark Nelson, and downloadable from Iambick books at a very reasonable rate - who I thank for their kind gift of a sample. I recommend it highly. You definitely make that sound interesting... Appealing response, Clare! My impression is of a tight, rather short triptych. I suppose you could see it like that, Marly - but each of those triptychs is detailed and impressive, and the sequence as a whole very surprising. Sunday Salon: more from the Far East. Dr. K Toyama and Mendel's laws of inheritance.